The Delaware Riverkeeper’s trust-funder agenda is on display again in Tinicum Township, Bucks County where the group seeks to ensure a sugar-daddy’s privacy. R. Bruce Wallace, an artist and grandson of former Vice-President and Progressive Party Presidential candidate Henry A. Wallace. He’s a trust-funder. I wrote about him here last year. He and other family members inherited a big chunk of old Henry’s the socialist’s fortune made through capitalism. These trust-funders also established several foundations to spend some of that fortune on pet causes. One of these is the Woodtiger Fund, which has over $60 million in assets. Bruce and his wife Susan, who live in Tinicum Township, Bucks County, Pennsylvania, appear to have given the Delaware Riverkeeper no less than $975,000, and probably much more, to ensure their personal privacy in a fight against public safety. Bruce Wallace lives on Sheephole Road on one side of Tinicum Creek, which is crossed by the Headquarters Road Bridge. The bridge had to be closed in 2005. There’s been a battle ever since over whether and how to replace it, as it provides critical emergency access for the folks on the other side. 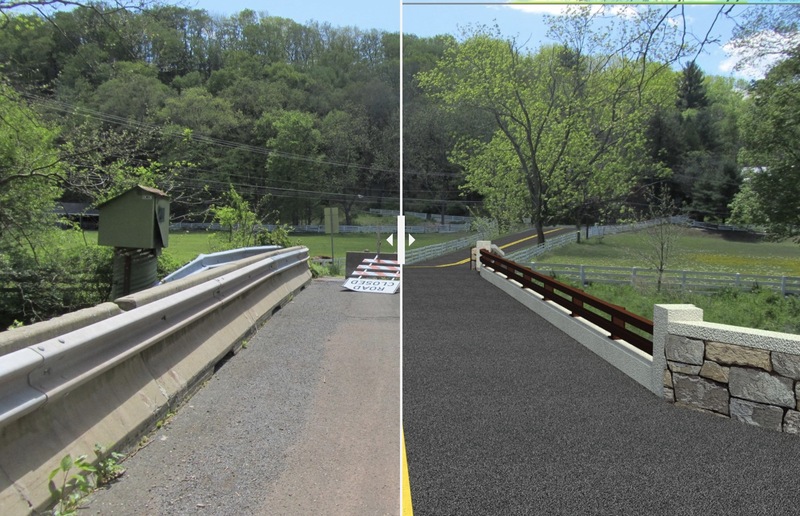 PennDOT wants to replace the one-lane bridge with a very similar style two-lane version that would ensure public safety. Replacing and upgrading the bridge would potentially send more traffic past Bruce and Susan’s home though. So, naturally, they’re opposed to any upgrade. The Delaware Riverkeeper is their hired gun in this fight. It has sued PennDOT to stop the whole thing after 13 years of planning claiming “there is no defense for PennDOT or the federal government’s decision to destroy the bridge and inflict damage on the exceptional value Tinicum Creek.” The phrase “exceptional value” is very significant as we shall see. 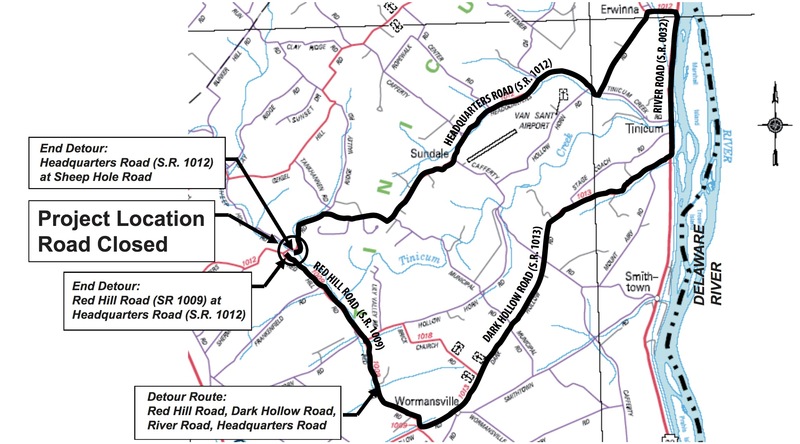 For the seven years the bridge on Headquarters Road in Tinicum Township has been closed, it has taken an additional seven or eight minutes to get to Route 611 and points west. The shortest way out is Tankhannen Road, a one-lane, relatively steep, rutted dirt road, upon which you might meet another car or truck and have to back up a significant distance. Have the number for a towing company handy should this happen in snow or rain. It takes fire trucks and ambulances an additional seven to eight minutes to get to our homes, and when a neighbor had an emergency, the ambulance took her on a bumpy dirt road ( second shortest route), spending several extra valuable minutes trying to make the turn onto a one-lane bridge, pulling up then going back, trying to get the angle right. 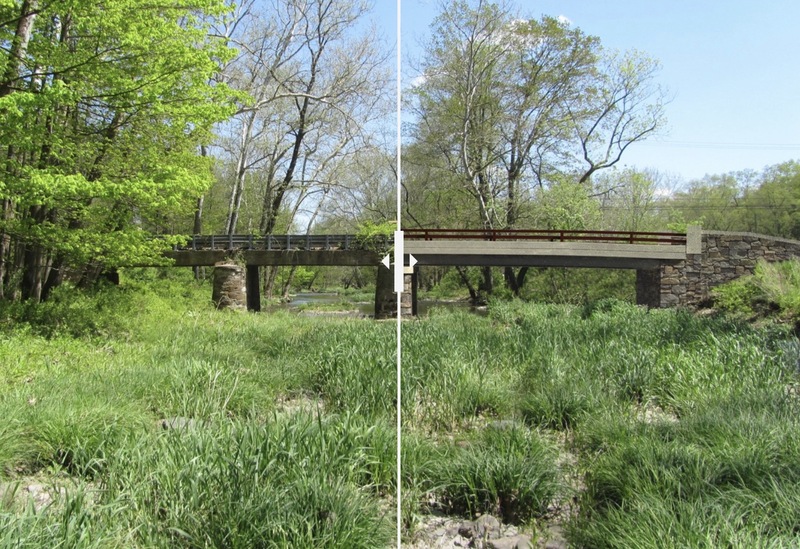 The Riverkeeper cites environmental concerns, claiming a two lane bridge would disturb the “exceptional value” Tinicum Creek, causing a “fire-hose” effect and eroding the stream, ( dubious, as the replacement bridge would have one pillar, rather than two) but they have no problem with increased car and truck traffic driving through – and occasionally getting stuck in – this same “exceptional-value” stream at the ford on Municipal Road. The environmental concerns seem wanting, and erosion can be prevented. The Riverkeeper claims the bridge would be replaced with an “oversized, modem structure… It is neither oversized, nor modem in appearance. In fact, the rendering looks relatively similar to the existing bridge. 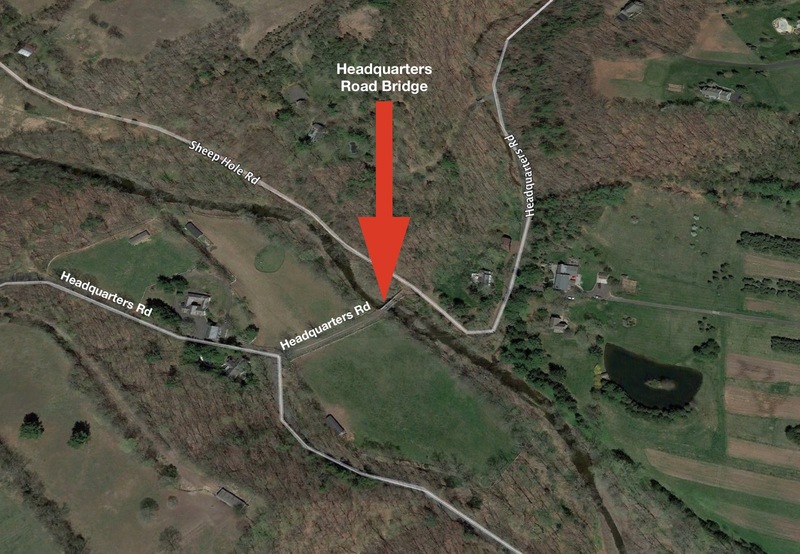 The Riverkeeper also claims the bridge would put more traffic on Headquarters Road. This is true for the western side of the bridge, since it gets almost no traffic now, but Headquarters is hardly a major thoroughfare or cut-through, and having the bridge would reduce traffic on the one-lane dirt roads and weight-limited bridges currently being over-used, and often at speeds too fast for road conditions. The Riverkeeper also claims that a two-lane bridge would increase speeds on Headquarters, which is preposterous, since the bridge will be about 100 feet long, the road is narrow on either side, and there is a hard turn on the eastern side of the bridge. If necessary, stop signs would be a simple, inexpensive solution. The neighbors of the Headquarters Road bridge need this bridge for their safety and convenience, and need it as quickly as possible. Our property values have fallen, it’s difficult to sell our homes, our cars have excess wear and tear, and hours of our time are taken with the detours. We are beyond caring whether the bridge is one or two lanes. The Riverkeeper claims the Headquarters bridge is historic and needs to be preserved. Fair enough. However, they fail to mention in their press releases that PennDOT will only install a one-lane bridge if the local governing body maintains it. A few years ago, after a closure of seven or more years, Tinicum Township agreed to take ownership of a bridge on Geigel Hill Road so it could finally be replaced. That recently-completed one-lane bridge has already been damaged. Tinicum Township and its taxpayers cannot continue to take responsibility for maintenance of one-lane bridges because a politically- motivated special interest group wants things their way. The Riverkeeper has moved far beyond its mission of a free-flowing, clean, healthy Delaware and its tributaries. Their concerns for the Headquarters Bridge extend to its historical significance, traffic flow and speed, and bridge width, design and construction. If the Riverkeeper and its well-heeled donors want a one-lane bridge, the solution is simple. They can create a fund for maintenance. Otherwise, they can get out of the way, PennDOT can build the damed bridge, and we can get on with our lives. Nolan makes an excellent case and the frustration of residents whose public safety Wallace and company apparently couldn’t care less about is obvious. Wallace represents the gentry class, an aristocratic ruling class with piles of cash they never earned. They are using it to impose their will and enhance their exclusive privacy at the expense of everyone else’s public safety. The Delaware Riverkeeper a/k/a PovertyKeeper is their tool. The PovertyKeeper, in fact, received $1,750,000 from Woodtiger between 2014 and 2016, some $975,000 of which was specifically designated to “Support of efforts related to Pennsylvania’s surface waters anti-degradation.” The latter number includes $425,000 in 2016 alone. The grant description may seem unusual for those who unfamiliar with anti-degradation policy and what it means. It has to do with a bizarre Federal policy that classifies streams by quality and insists that once a high level has obtained future activity must be reined in so as to ensure no going backward. Although it has a certain superficial resonance to obtuse public policy types, it’s really punishment for having protected or enhanced water quality. It’s like a rule demanding that the cleaner you keep your car, the less you should be allowed to drive it. Even though you are able to drive and wash your car regularly to keep it clean, it’s assumed only a cessation of driving can possibly keep it clean in the future. Is the Povertykeeper exploiting Wallace by getting him to pony up what is probably well over $1 million to lead the attack on the upgrade of this bridge? Is the Povertykeeper using the money to cover its overhead, making it that much easier to pursue the William Penn Foundation’s anti-gas agenda? Is Wallace using the Povertykeeper as a tool to advance his own personal in]terests , rather than those of the Woodtiger Fund? A section 501(c)(3) organization must not be organized or operated for the benefit of private interests, such as the creator or the creator’s family, shareholders of the organization, other designated individuals, or persons controlled directly or indirectly by such private interests. Can there be any doubt Woodtiger grants for “support of efforts related to Pennsylvania’s surface waters anti-degradation” are simply a method of funding Bruce Wallace’s obsession with keep this bridge closed and sticking it to other residents who simply want public safety? If so, and I believe it is so, then both the Delaware Riverkeeper and the Woodtiger Fund are violating one of the cardinal rules for non-profit tax-exempts. It’s also no accident that both organizations use the same legal counsel — the law firm of radical Attorney Jordan Yeager. Where does this leave things? Well, let me make a suggestion. If the folks of Tinicum Township are serious about halting this abuse, they’ll go to court and raise these issues. Bruce Wallace and the Povertykeeper are free to take whatever position on the bridge they want but they don’t get to do it through tax-exempt charities at our expense. Tom, this is another example of the hypocrisy of NGO’s. Thank you for your investigations. Hopefully, the courts will see through this nonsense and rule in favor of the people, who really need this bridge.